I’ve seen a lot of very interesting apps come out of the App Store lately. It’s always fun to check the Top 25 and see a new app available. However, some of the best apps to date are available only via the jailbreak (I’m thinking of QIK and PDAnet). Today we’re going to check out a program that will appeal to all you podcast listeners out there. In the words of the creator, Podcaster will “allow you to subscribe, manage, stream and download podcasts directly to your iPhone and iPod Touch.” The interface allows you to stream the podcasts over 3G/EDGE/WiFi via the Quicktime player. You can import your own podcasts plus you can view featured, newest, top rated, and popular podcasts. You can also search for podcasts by title. 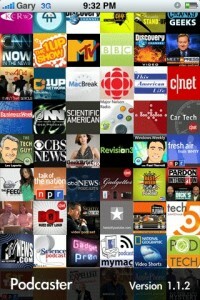 This app as you can see includes lots of options for you to find your favorite podcasts. 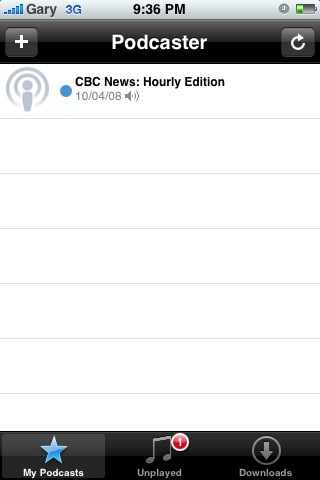 In my testing of Podcaster I tested out downloading podcasts from the CBC (being a Canadian blog). 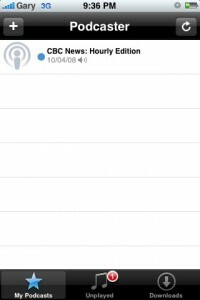 I was able to view and download from over 30 CBC Radio podcasts, including their CBC News: Hourly Edition podcast, which is great for news on the go. FREE Podcaster Activation Codes for iPhoneinCanada.ca Readers! To get Podcaster on your iPhone you will be required to jailbreak your iPhone. Follow my video tutorial here on jailbreaking your iPhone 3G on 2.1. The app is available via Cydia Installer. For all my loyal readers, you are most likely familiar with my love of giving things away in a contest. Well, the creator of Podcaster has a special treat for you iPhoneinCanada.ca readers out there. Available for 20 free activation codes for Podcaster! Enter the following code into Podcaster and the app will be yours FREE! The early bird gets the worm! Be sure to let me know in the comments if you were able to get the code in time! Enjoy! Let me know what you think about this 3rd party app in the comments! It should be in the App Store if you ask me!